For this recipe I used the Naked Chicken by Joyce Farms courtesy of The Peachstand, raised without antibiotics, hormones or steroids, the flavor of this free range chicken is beyond superior! Simply roasted, shredded and lightly dressed while still warm, for a delicious taste sensation. I do love chicken salad, but I’ve never been a fan of the heavy mayonn-aisy dressing! To lighten up this dressing, I created a blend of buttermilk and an Asian spin with rice vinegar, toasted sesame oil and wasabi. For the mayonnaise I used the healthier choice of avocado mayonnaise, home made could also be substituted. 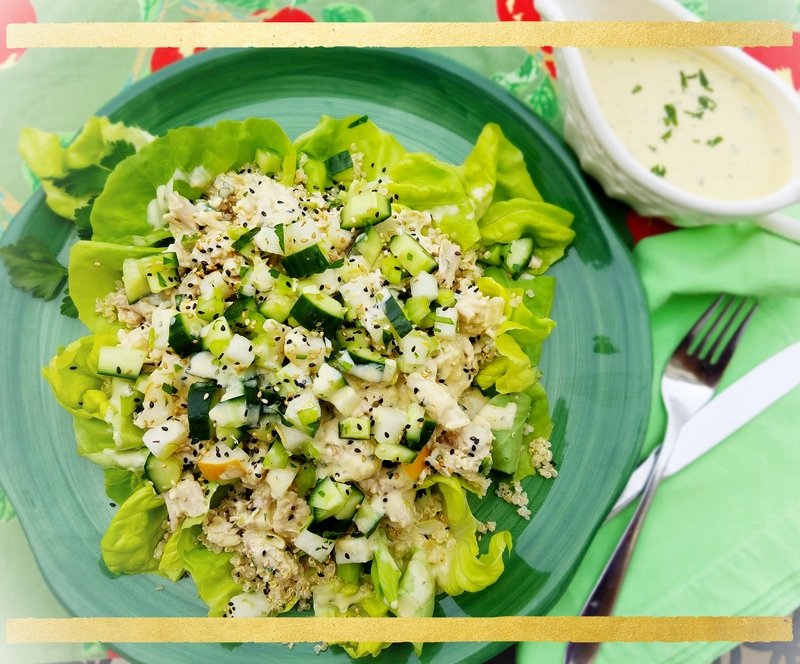 Cool crisp cucumber and sweet crunchy Asian Pears provided the perfect contrast to this tangy salad, you could substitute regular pears, simply look for those that are still a little firm. And lastly, I nestled the salad on quinoa and delicate, buttery Boston Bib lettuce, I hope you try this beautiful salad with notes of spring! Roast the Chicken; preheat the oven to 375F, season the chicken with salt, pepper and one tablespoon of olive oil. Place on a roasting pan, and roast for 45 minute, breast side down. Flip and roast a further 45 minutes. Allow to cool enough to handle, shred chicken, discard the bones or reserve to make home made broth. While the chicken roasts, prepare the Salad ingredients and the Tangy Wasabi Buttermilk Dressing. Toss the salad ingredients with a squeeze of lemon and the chopped parsley. Toss the warm chicken with just enough dressing to coat. Serve immediately, or allow to chill. 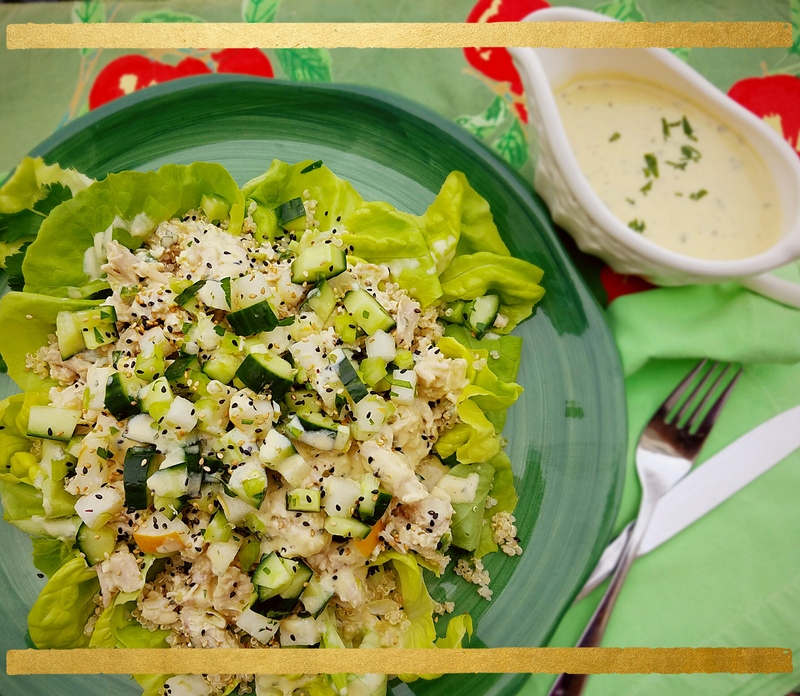 To serve, assemble each plate or a large platter with lettuce, top with a little quinoa, the chicken salad, Asian pear, cucumber and celery. Sprinkle with the sesame shake and serve with extra dressing on the side. Ready roast deli chicken can be substituted.